If the trend in development of eco-friendly bank buildings is any indication, big banks are seeing the economic value of going green. Because of the scale of these projects and the visibility of the brands behind them, eco-friendly bank buildings have the potential to have considerable impact on global opinion regarding environmental issues. If you’re considering a career in banking and you’re sensitive to environmental issues, you’d do well to consider the employers represented here. These projects were chosen because of their exceptional aesthetic properties and their commitment to a high level of sustainability. Many of the banks behind them offer sustainable lending and find additional ways to promote the well-being of their employees and customers. Designed by Pharos Architects, South Sudan’s World Bank Building is the first LEED (Leadership in Energy and Environmental Design) Certified building in the country. With a yearly temperature that averages 94 degrees Fahrenheit, designers worked to reduce the building’s interior temperature by increasing the use of daylight and limiting overhead lighting. Surrounded by a lush landscape and numerous large trees, the 4,183 square foot structure is cooled with natural shade and a new air conditioning system meant to increase energy efficiency. With limited local natural resources, designers sourced materials from up to 500 miles away including recycled milk cartons that were utilized as ceiling tiles throughout the building. San Diego’s Union Bank building was originally constructed in 1966 and was updated to achieve LEED Gold Certification in 2010. Low flush toilets and low flow fixtures were installed throughout the structure, and the original lighting was replaced with a more energy efficient system, utilizing reduced or fully eliminated mercury content. Formerly known as the Union Bank of California, NA, the renewed structure also incorporates a green-cleaning program using eco-friendly organic compounds instead of harsh chemicals. Headquartered in San Francisco, Union Bank believes that the use of sustainable, eco-friendly materials, and resources contribute to enhanced employee performance and a healthier workplace. Located in the heart of the Midwest and designed and engineered by R.A. Smith National, Johnson Bank’s Brookfield location was LEED certified in 2009. Building designers were faced with multiple hurdles when considering the location of the building as it sits within a floodplain and protected wetland area. The 14,200 square foot structure incorporates the use of daylight throughout 75% of the occupied space, and 50% FSC (Forest Stewardship Council) Certified wood products comprise the structure. Johnson Bank’s focus on service, security, and sustainability is echoed throughout the building’s design. Opened in 2011, TD Bank’s Cypress Creek Store is the first net-zero-energy retail bank in the nation. Utilizing the energy created from the 400 photovoltaic panels onsite, the structure creates and uses all the energy it needs to operate. Designed by Bergmann Associates, the single story 3,969 square foot building incorporates a high efficiency HVAC system to cool the interior from Florida’s hot and humid climate, and numerous plants also surround the structure to provide shade. Progressive and innovative, the building also integrates numerous skylights to maximize natural light, and the structure functions as a model for current trends toward net-zero building. The First Bank and Trust of Skokie, Illinois was designed by architects Behles and Behles and was recognized by the Skokie Beautification and Improvement Commission in 2013. Initially, the ‘brown site’ required extensive soil remediation, and the 3,610 square foot structure includes a full-service banking area, an automated teller machine, and three drive-through tellers. 100% LED (light-emitting diode) lights exist throughout the building, as well as a green roof. Architects also incorporated maximum daylight use to promote a healthier indoor environment for bank employees. 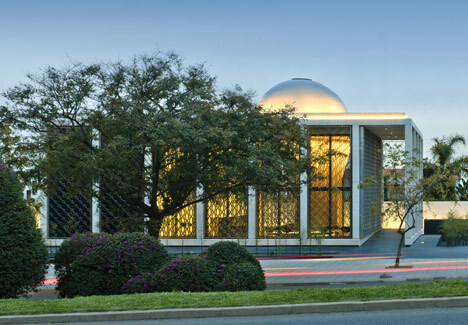 Located in Austin, Texas, Prosperity Bank’s Oak Hill branch was designed by Levy Architects, and holds a Green Star from the Austin Green Building Program. Extensive use of materials sourced in Central Texas gives this unique building a contemporary elegance, and includes exposed wood, limestone, metal, and stucco veneer. The interior provides ample daylight through the use of glass walls, and the 4,100 square foot building combines careful site analysis with an attention to light, materials, and craft. The bank also features two 7,500-gallon water tanks to irrigate the surrounding landscape with collected rainwater. Rated five stars from the Green Building Council of South Africa, the Standard Bank stands as a feat of modern, energy efficient construction. Multiple buildings comprise the bank’s campus complex including a nine-story structure and an eleven-story structure that together contain 753,470 square feet. The state-of-the-art campus features over 400 indigenous trees onsite, as well as a large central atrium. 60% of the steel used to create the bank comes from 90% post-consumer recycled content, and 50% of the timber used in the buildings’ construction was sourced from FSC certified suppliers. Perhaps one of the world’s most controversial and well-known eco-friendly bank buildings, the Bank of America Tower in New York City was designed by Cook and Fox architects, and was completed in 2010. Advertised to be one of the world’s most eco-friendly skyscrapers, the Bank of America Tower was the first building in the world to attain LEED Platinum certification. As a model for green building, the structure utilizes an automatic daylight dimming system and a grey water system to capture and reuse rainwater. Discovered in 2013 to use twice the energy as the Empire State Building, the Bank of America Tower continues to strive toward increased energy efficiency. Originally constructed in 1984, the Deutsche Bank Towers recently experienced a three-year renovation with the help of Milanese architect Mario Bellini. Completed in 2011, the building achieved LEED Platinum certification, and was presented with the Best Green Intelligent Buildings Award in 2011 at the International Green Awards Ceremony. The refurbishment has decreased heating and cooling energy consumption by 67%, has reduced carbon dioxide emissions by 90%, and has cut water consumption by 70%. Known throughout Europe as a symbol of Germany’s thriving economy, the newly renovated towers also represent Europe’s move toward greener building solutions. Italy’s tallest building was designed by Cesar Pelli and opened in 2012. 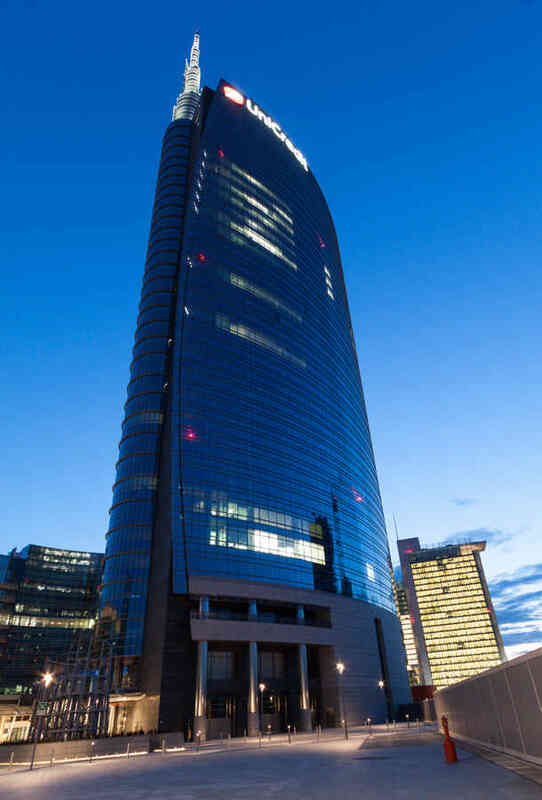 Located in Milan’s Porta Nuova district, the LEED Gold certified structure optimizes the use of natural resources, by providing natural light to nearly 90% of the building’s occupied spaces. Currently utilized as the bank’s headquarters, the building’s energy reduction has decreased by almost 37% when compared to similar constructions, and the high performance glazing across the surface helps control the structure’s internal temperature. High efficiency lighting was also installed, and outside air is filtered into the interior to offer a comfortable internal temperature. Completed in 2008, the European Investment Bank in Luxembourg City was designed by Ingenhoven Architects to exist symbiotically with the surrounding environment and the original structure by Sir Denys Lasdun. The building’s lightweight glass and steel shell allows occupants to open windows for ventilation control, and incorporates winter gardens and atriums to improve interior temperatures. The structure was designed to maximize airflow and cooling during the warmer summer months, and minimize excess energy use during the cooler winter months. The zigzag construction was designed to simulate a non-hierarchical work environment, and encourages communication throughout the bank’s numerous departments. Built on the site of a 1820s-era mansion, the newly constructed Kennebec Savings Bank opened in December of 2012. The 3,500 square foot bank building was designed to resemble the former structure that existed on the site that was demolished the year before. Rather than refurbishing the site’s original building, designers determined that the previous construction had deteriorated and was structurally unsound, and therefore unfit for renovation. In its place sits a carriage-house style structure that incorporates low-emission carpets, extensive daylight, and heavily insulated walls and windows. Built by Bangor, Maine firm WBRC, the Kennebec Saving Bank is seeking LEED Silver certification. Perhaps one of the Pacific Northwest’s most important models of green building, Boise, Idaho’s Banner Bank Building is the state’s first multi-tenant LEED Platinum certified structure. Constructed from recycled and local materials, HDR architects engineered an energy-efficient building that uses 50% less energy and 65% less potable water than other buildings of comparable size. 90% of the construction debris from the Banner Bank Building was diverted from landfills, and the structure is composed of 42% recycled materials. Founded in 1981 with the hopes of bringing the concept of sustainable banking to the UK, Ecology Building Society’s focus on creating a healthy planet extends beyond their corporate lending model. Their current headquarters won Sustainable Building of the Year in 2005, and the structure showcases the society’s commitment to responsible environmental design principles. Utilizing natural daylight whenever possible the airtight structure, designed by Hodson Architects, incorporates windows from local suppliers, the Green Building Store, which provided low emissive glazing to increase energy efficiency. Beautiful and understated, the company has become a pioneer of green banking and sustainability. The 40,000 square foot expansion of Frankfurt’s KfW Bank was designed by Sauerbruch Hutton Architects of Berlin, and was intended to be Europe’s most energy-efficient building. 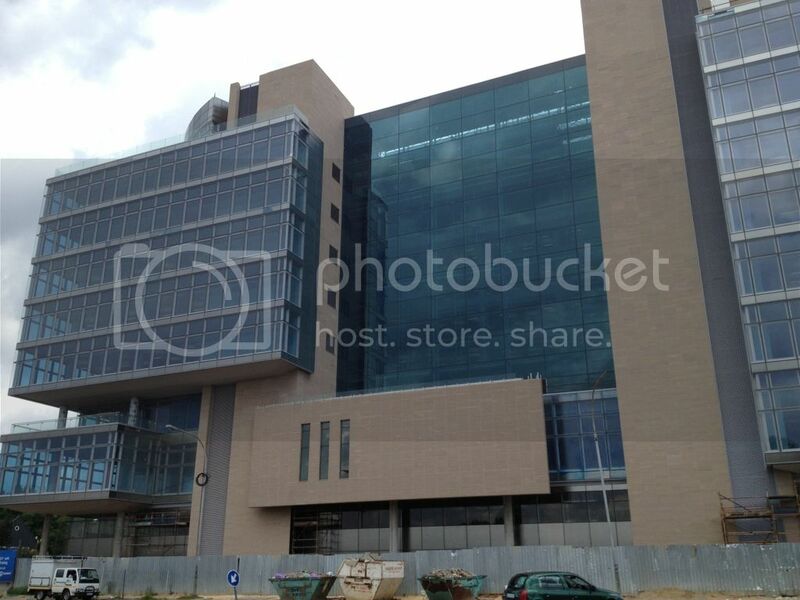 Also known as the Westarkade, the building houses 700 employees and a conference center. Located along Palm Tree Garden, one of Europe’s most popular botanical gardens, the building’s shape encourages natural ventilation and daylight. The façade is composed of a “skin” comprised colorful, computer controlled panels to maximize airflow, and lower cooling costs. With two modular locations in Rabat and Casablanca, BMCE’s Regional Headquarters combines ancient Islamic aesthetics with a modern focus on sustainability. The design’s interior dome uses a traditional local plaster technique known as tadelakt, and the exterior is covered with ceramic tiles. Architectural firm Foster and Partners also utilized local materials like black granite and grey limestone in the building’s design, and the concrete frame is covered with panels and stainless steel screens to maximize shade. With a nod toward ancient Islamic pattern and design, the building acts as a model for eco-friendly, contemporary building solutions, which are rooted in history. While far from a traditional lending company, Italy’s Eye Bank offers patients the latest innovations in eye transplants and care. The building’s trapezoidal design by Emilio Ambasz Associates creates a stunning, contemporary solution for the facility’s research lab and educational facility. Composed of angled, 40-foot high, pre-patinated copper walls, the design maximizes the use of daylight, and the angled walls assist in cooling the structure. Greenery also aids cooling as the structure is partially covered with plants, and the triangular positioning of the elements creates a natural “outdoor amphitheater.” The 54,000 square foot design also incorporates an extensive underground parking structure, which allows the above ground structure to better merge with the surrounding landscape. Foster and Partners’ Banco Ciudad de Buenos Aires was completed in 2010 and acts as a striking addition to the city’s landscape. The unmistakable wave-like roof complements the site’s neighboring park, and the four-story structure has ample light and natural shade. The building’s facades were directionally oriented toward the sun’s path to allow for maximization of daylight and ventilation. Composed of reinforced concrete, each office has park-side views and external patios are scattered throughout the building. The building leads Argentina’s shift toward eco-friendly and sustainable design in South America. The Mauritius Commercial Bank is the first in the Southern Hemisphere to receive a BREEAM rating. The magnificent ten-story structure is a bastion of green energy design, as well as a striking example of contemporary architecture. Offices are fitted with ergonomically designed furnishings, and the facility harvests and stores rainwater in concrete tanks below ground for plumbing. Solar heating and an open interior plan contribute to a more comfortable working environment, and the structure’s north-south alignment and lack of east-west facing windows minimizes the building’s heat intake. 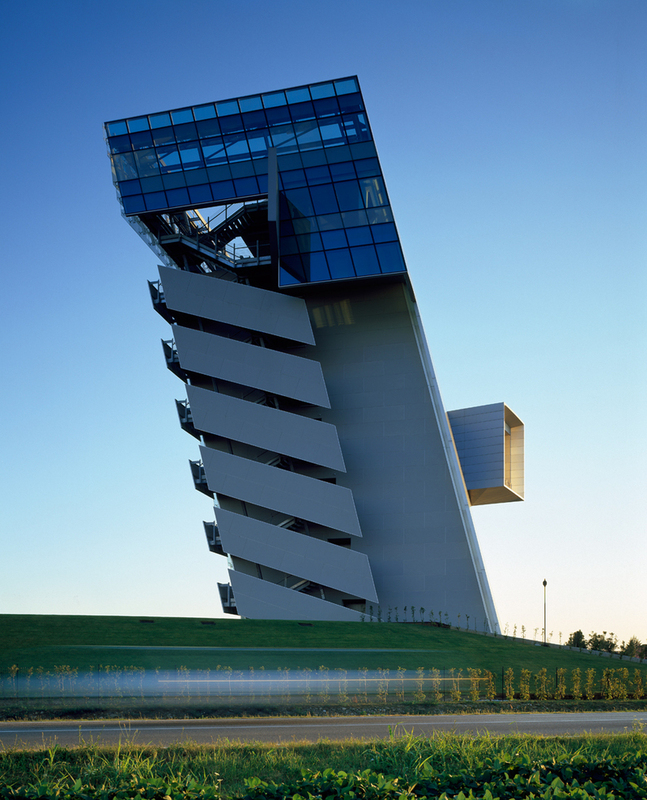 Designed by Morphosis Architects, the leaning Hypo Alpe-Adria Bank Headquarters is reminiscent of Italy’s 14th century Tower of Pisa. The bank’s campus covers 26-acres, and was designed to encourage health, happiness, and productivity of bank employees. Efficiency and environmentally responsible design solutions include a 14-degree lean incorporated into the structure to allow the upper floors to shade the lower floors. Interwoven components promote movement within the space to improve employee interaction and communication, and each office has an exterior view. Natural daylight and ventilation also contribute to a happier, healthier work environment. Auckland’s Jean Batten Building, built in 1942 serves as the base for the newly expanded and renovated Deloitte Centre. Known as New Zealand’s first high-rise to achieve a Five Star design rating from the New Zealand Green Building Council (NZGBC) architects considered employee well being when considering each aspect of the structure. Double ventilated glass provides ample ventilation, and the building collects rainwater to maintain more energy efficient plumbing. Onsite showers encourage employees to walk and ride their bicycles to work, and maximum use of daylight and winter gardens are featured throughout the design. Utilized primarily as mixed-use office and retail space, Auckland’s contemporary Ironbank is a homage to its location on the edge of the city’s commercial business district. Appearing as a number of stacked shipping containers, the structure’s modular and industrial façade is composed of glass-reinforced concrete. Designed by Auckland’s RTA Studio, the building’s eco-friendly composition includes rainwater collection and reuse, solar hot water heating, and a natural ventilation system. Given a Five Star rating from NZGBC, 95% of the building’s construction materials were recycled upon completion of the project in 2009. Located in Dallas, Texas, the 72-story Bank of America Plaza was built in 1985 by JPJ Architects. Known as the city’s tallest building, and the third tallest in Texas, the Bank of America Plaza underwent an extensive renovation in 2013 to replace original lighting with LED tubes. The building’s notched corners nod to the Art Deco-era, and the original surface parking area was converted into Belo Garden Park. The public park has numerous perennial gardens, green spaces, shaded areas, and a fountain. Completed in 2004 and designed by Bligh Voller Nield Architects, the National Australia Bank headquarters has proven to be a leader in green building solutions. The nine-story high rise is composed of concrete, and has won numerous design awards including the 2005 RAIA (Royal Institute of Australian Architects) National Interior Architecture Award and the RAIA Victoria Commercial Architecture Award. Designed to create a worker and eco-friendly environment, the structure has improved air quality and ventilation with the hopes of contributing to worker comfort and productivity. Another Australian beauty, the Australia and New Zealand Banking Group was designed by Lend Lease Design and has been rated a Six Star rating from the NZGBC. Designers wanted to create an elegant structure that offered workers a high level of daylight along with open plan workstations to encourage communication and work flow. 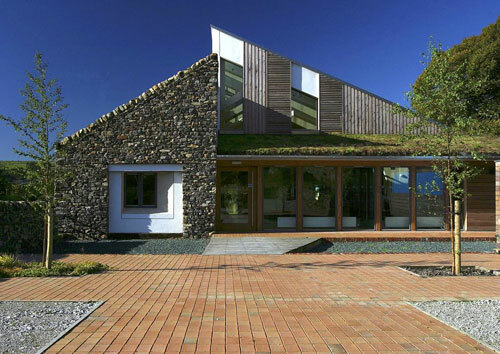 Located along the river, the building’s green features include wind turbines, solar panels, and a green roof. Gas-generated electricity and water recycling are also utilized throughout the structure. Ample bicycle parking encourages physical activity, and the ground floors are composed of recycled hardwood.